The German Emperor Wilhelm II went into exile in the Netherlands in November of 1918. Based on photographs and other information, a Model 1909 Schwarzlose Pistol was part of his property at the time. Here we present this exceptional weapon and its manufacturer. Use the arrows below the photographs to navigate to additional images. Due to the recent liquidation of a collector’s estate, a Schwarzlose Pistol Model 1909 became available. Only a cursory examination of this weapon was required to see that it was something extraordinary: The left grip showed an intertwined emblem, “W” with “II”, which was a monogram associated with the last German Emperor, Wilhelm II. The increased interest in early German pistols has also increased the incidence of fakes, so we proceeded with care as we researched the background of this weapon and attempted to ascertain it’s historical context and provenance. Our first step was to research the recent history of this fascinating pistol; however, the gun’s origin was unclear. The collector died without leaving any documentation and his relatives did not know where it came from. Sadly, his family had accepted his hobby but took little interest in it and were ignorant the history of the objects that he acquired. Like a story out of a dime novel, this man had taken all his knowledge with him to the grave. Our efforts met with some skepticism from the owner’s collector friends, and initial research with the Prussian Cultural Heritage Foundation in regard to Wilhelm II’s firearms was fruitless. Further, his Dutch place of exile, the “Haus Doorn”, was a dead-end and documentation from the Schwarzlose Company could not be located. Fortunately, however, there are numerous photographs of the Emperor armed with holstered pistols. During WW I the Emperor carried Parabellum pistols as might be expected during wartime. However, photographs of him hunting from the years 1910 and 1912 show a holster with the contour of a Schwarzlose M.1909, and these dates match the early production dates of the pistol. Ultimately, locating photographs of the holster enabled us to verify the provenance of the gun. In the collector’s estate we found a holster to which no one had paid any attention. It is a costly little holster made of soft, green leather sewn with green twine. It had to be the holster for the Schwarzlose because it clearly shows the contours of the gun. Old photographs of Wilhelm II show him wearing this holster, confirming that the Schwarzlose was one of his pistols. Verifying the authenticity of the grip monogram was the final problem to be addressed. This was summarily dealt with by the fortunate coincidence of an object being sold at auction. In January 2011 the famous Munich auction house Hermann Historica sold a picture frame from the Emperor’s estate which showed a nearly identical emblem in all four corners. The pistol is stamped with the number “1” on all major parts and on the bottom of the magazine. 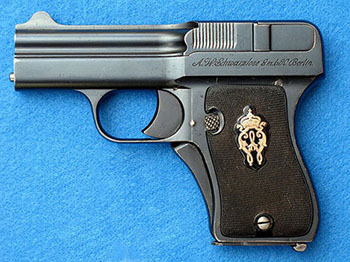 While it is unlikely that this is the first pistol of this model ever produced, it is entirely likely that the serial number “1” was reserved in honor of the emperor. That said, the exact date of its manufacture may never be known. 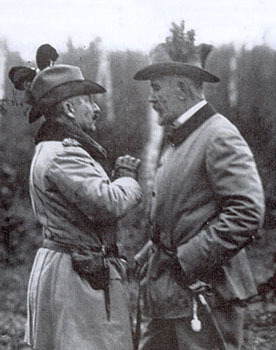 Emperor Wilhelm I (left) with his Schwarzlose pistol in its holster. It is obvious that the right grip is not original because it is made of wood, whereas normally these pistols had hard rubber grips. The grip is well manufactured and the markings indicate that it is old. Why the emperor should have carried this pistol only while hunting remains uncertain. Wilhelm II was disabled and suffered from a birth defect that resulted in him having a left arm shorter than the right. He carried a sidearm while hunting, presumably, to deliver the coup de grace to wounded game. Could the principle of “reverse recoil” have made the gun easier for him to handle? In any event, it is doubtful that Wilhelm dispatched wounded prey on his own which is just as well since the 7.65mm cartridge is really not adequate for a finishing shot for larger game. Most well-versed collectors and experts would think first of Mauser, Maxim or Browning when discussing automatic weapons, and not about Andreas Schwarzlose, which is unfortunate. Andreas Wilhelm Schwarzlose was born to a farmer on July 31, 1867 in Wust, Brandenburg, and died April 18, 1936. After having served as a young man with the Austro-Hungarian Artillery he graduated from the Artillery Technical School and completed his education in Suhl. In 1892 at the age of 25 he constructed his first self-loading pistol and applied for a patent on December 14th of the same year. 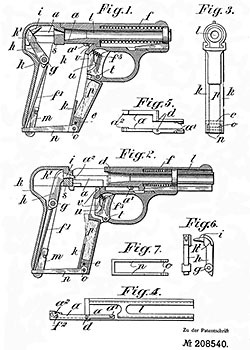 The patent awarded (number 70130) for a self-loading pistol with hammer and breech block was granted the following year. This first patent shows that Schwarzlose was quite innovative and that he loved unusual and elaborate technical solutions. This can be seen throughout his career. Today it might seem a little strange that someone should produce a pistol for military purposes with a magazine beneath the barrel and which carried rimmed cartridges upside down. Not surprisingly, only a few of these were ever produced, the gun never made it into regular production. Although this first pistol was not a success, Schwarzlose generated more ideas and experimented with many other breech designs. In 1897 he was granted a patent for a self-loading pistol with a toggle-lock action and a fixed barrel. Known as the Model 1898, a significant number were produced. On 24 March 1907 Schwarzlose applied for a patent for a self-loading pistol with a sliding barrel which stops against a fixed breech. Patent number 194921 was granted February 4 for this design. Production of this unusual gun began in 1909. Unlike all other pistols of the day, the Schwarzlose M1909 operated with a reverse recoil action. That is to say that the force of the recoil cycled the action of the pistol by driving the barrel forward rather than a slide backward. Despite its unusual design, approximately 8,000 Model 1909 pistols were produced by 1911. A respectable run. From a technical perspective the gun, with its mass of about 17.5 oz (500 grams), was quite inventive. The breech block is part of the frame. To load the pistol the barrel must be pulled forward against the main spring. On its way back a cartridge is pushed into the chamber and the internal hammer is cocked. When fired the barrel moves forward and pulls out the cartridge which is held by the extractor at the breech and is then ejected. 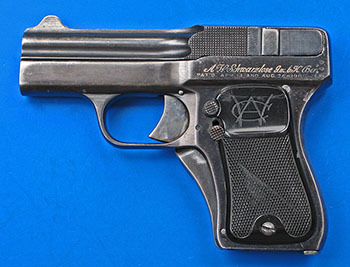 German Schwarzlose pistols show the usual inscription “A.W. Schwarzlose GmbH Berlin” on the left side and on the right side is stamped the company emblem, a machine gun with the Schwarzlose name above. In the literature it is said that disassembly of the M.1909 is difficult. That is wrong, it is really a quite simple process. While pulling the barrel forward to its end position, press the spring rod that protrudes from below it, up, and pull the barrel assembly off. This is enough for normal cleaning purposes. Some authors, like Hogg and Weeks, state that the gun is quite comfortable to shoot due to its forward moving mass. Our gun was the opposite. It had a hard recoil and hurt the heel of the hand. There was no chance of comfortable shooting. A good feature is that the grip safety can be locked down by a small button, which means that the gun is always ready to fire. According to Lang and Wotka, a number of M.1909 pistols were shipped to the U.S. The importer was the Warner Arms Corporation (WAC) of Brooklyn in New York City, which added its name and address beneath the Schwarzlose emblem. The other side of the gun lists two US patents. WAC was founded in 1912 only to import and trade Schwarzlose M.1909 pistols. Mathews writes that machinery, tools and parts were taken over by WAC and that there might have been some parts production in the US. This assumption is supported by Ernie Lang who examined WAC marked guns with a poorer finish and weaker steel than guns known to have been made in Germany. However, this could also be due to varying tolerances in Schwarzlose production. WAC moved to Norwich, Massachusetts and was renamed the Davis-Warner Arms Corporation in 1917. This company was closed in 1919 after having unsuccessfully produced three versions of a follow-on model to the M.1909 called the “Infallible”. At least one of these models clearly displays grips with a WAC inscription identical to that found on the U.S. Schwarzlose pistols. Instead of serrations there is a kind of checkering. The trigger and the grip safety, which are now color casted, have some checkered areas. The extractor is now external and varies in length (short and long). A few pistols have the magazine release on the side of the frame and not at the bottom of the grip. All models show the US patents inscription. WAC pistols do not have a proof stamp. It is worth mentioning that a WAC model which is shown by Shruk/Brukner (p. 187, picture 9) has a previously undocumented grip variant. Additionally the first and second model are interchanged. Except for luxury versions, only two types of grips have been observed. Early grips had a complete checkering and later grips had partial checkering with a light thumb rest. There also might have been a third variant of the M.1909. Observed pieces give hints about production. All observed M. 1909 pistols, up to serial number 3500, show the proof mark Crown B with Crown U. Number 3541 shows the new proof mark which came into use in September 1911 (Crown N). However this mark was at first only used for rifles; Schwarzlose pistols with the Crown N could not have been proofed prior to 1912. According to most sources production ended in 1911. However, the highest serial number observed on a German Schwarzlose is 6489. Hence the data regarding production dates is questionable since Schwarzlose would have produced only 3,500 pistols in three years (1909-1911) and then produced another 3000+ pistols before production ended. Clearly, production dates need further study. 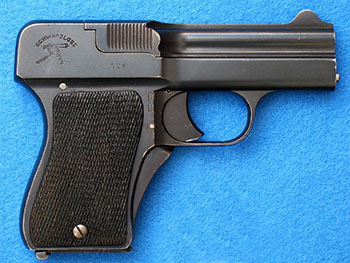 WAC pistols were observed in the serial number range of from 249 to 1494. 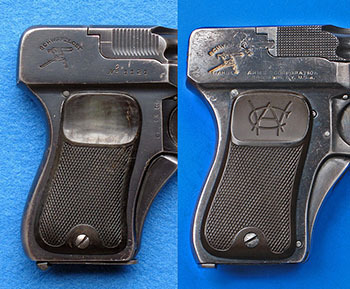 In the Czech Republic there is a model without a grip safety, inscriptions, or proof marks but with an internal extractor. It also has different serrations. This is obviously one of the first prototypes and has only a 3 as an internal number. Not much is to be found in the literature and the pistols are quite scarce. So the author had to observe reference samples. Data provided by Ernie Lang and revised by Joe Wotka was quite helpful. But there are still many open questions about the Schwarzlose M.1909. It would be helpful to gather more information about serial numbers and proof marks. If you can help, please write to the RWII-editorial staff. Schwarzlose’s pistol construction ended with the Model 1909, making little contribution to his overall success when compared with his famous machine guns which were adopted by Austria-Hungary, Italy, the Czech Republic, the Netherlands and Sweden. These guns were still in use even in WWII. Copyright 2014 by Friedrich Müller and Dr. Stefan Klein. All rights reserved.